The key to understanding the calamitous Afghan war is the complex, ultimately failed relationship between the powerful, duplicitous Karzai family and the United States, brilliantly portrayed here by the former Kabul bureau chief for The Washington Post. The United States went to Afghanistan on a simple mission: avenge the September 11 attacks and drive the Taliban from power. This took less than two months. Over the course of the next decade, the ensuing fight for power and money—supplied to one of the poorest nations on earth, in ever-greater amounts—left the region even more dangerous than before the first troops arrived. At the center of this story is the Karzai family. President Hamid Karzai and his brothers began the war as symbols of a new Afghanistan: moderate, educated, fluent in the cultures of East and West, and the antithesis of the brutish and backward Taliban regime. The siblings, from a prominent political family close to Afghanistan’s former king, had been thrust into exile by the Soviet war. While Hamid Karzai lived in Pakistan and worked with the resistance, others moved to the United States, finding work as waiters and managers before opening their own restaurants. After September 11, the brothers returned home to help rebuild Afghanistan and reshape their homeland with ambitious plans. Today, with the country in shambles, they are in open conflict with one another and their Western allies. Joshua Partlow’s clear-eyed analysis reveals the mistakes, squandered hopes, and wasted chances behind the scenes of a would-be political dynasty. 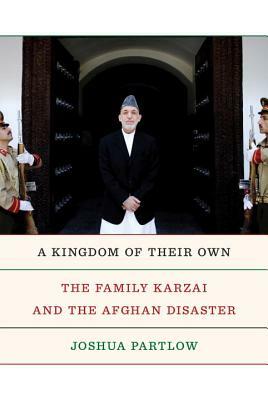 Nothing illustrates the arc of the war and America’s relationship with Afghanistan—from optimism to despair, friendship to enmity—as neatly as the story of the Karzai family itself, told here in its entirety for the first time. JOSHUA PARTLOW is The Washington Post’s bureau chief in Mexico. Between 2009 and 2012, he was the Post’s Kabul bureau chief, and has also worked as a correspondent in South America and Iraq. In 2010, Partlow shared an Overseas Press Club award with Rajiv Chandrasekaran for the best newspaper or news service reporting from abroad, in recognition of their series on the war in Afghanistan.